Free Wi-Fi indoor/outdoor pools an on-site restaurant/lounge and free parking make our guests happy at the pet-friendly Doubletree Hotel Augusta. The six-floor hotel has 179 rooms and suites offering signature "Sweet Dreams" bedding large work desks with ergonomic chairs and Wolfgang Puck coffee makers. Updated bathrooms boast cherry wood vanities and granite countertops. Other amenities include flat-panel LCD HDTVs with premium channels and pay movies mp3 clock radios and free Wi-Fi. Non-smoking accommodations are available by request. 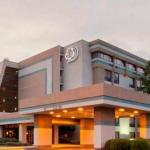 Doubletree Hotel Augusta has indoor/outdoor pools a hot tub sand volleyball court guest Laundromat and gift shop. The hotel restaurant serves breakfast lunch and dinner and the lobby lounge serves light meals. Evening room service provided for further convenience. A 24-hour business center is designed with corporate guests in mind. Parking is free. Pets are permitted for an additional fee. Convenient to both I-20 and I-520 Doubletree Hotel Augusta is five miles from Augusta State University. Augusta National Golf Club home of the Masters Tournament and Georgia Health Sciences University are 15 minutes away. Downtown Augusta Augusta Museum of History James Brown Arena and the Imperial Theater are within a 20-minute drive. Augusta Regional Airport is 13 miles from the property.